Erosion: The gradual destruction or diminution of something. The Latin version means to "wear or gnaw away." No one ever thought that this would be happening to the debt this nation owes our veterans, but some members of Congress are not even ashamed it is happening. They are actually pushing to do even more gnawing away of benefits disabled veterans fought for. Veterans risked their lives for this country. They became disabled doing it. They were promised to be taken care of. Then they had to fight the government to have their claims approved. All too often, it took years of suffering medically and financially. Once their compensation was granted with a "total and permanent" rating of 100%, they though this was a guarantee that they would never have to worry about again. For the last few years, they have been discovering that word "permanent" was subject to change. Some want to say that cutting the "unemployable" percentages from ratings makes sense because senior disabled veterans were retired like everyone else. What they do not want to acknowledge is the fact that once the disabled veterans stopped working because of their disability, they stopped paying into the system. Social Security benefits are based on how much they paid into the system. That means most of our disabled veterans, especially Vietnam veterans, will not be able to survive. If you think that the rate of senior veteran suicides is high now, this will push even more over the cliff. What most people do not know is how far the rating goes. A veteran with 100% disability receives $3,057.13 per month. If they are married, it is $3,227.58. For the rest of the breakdown, go to the VA chart. If they cut the unemployable and reduce the claim, to 90%, that reduces the amount down to $1,833.62. At 80% it is $1,631.69. At 70% it is down to $1,403.71. How can they pay their mortgages and rents with that huge drop in compensation? They will not be able to. We cannot make plans for our "golden age" when we do not know what Congress will pull next. We cannot depend on the VA when it is being sold piece by piece to private "providers" accountable to no one, being pushed into the healthcare system members of Congress keep trying to kill off. But, this gets even worse. Losing that 100% rating, will also cause the loss of most of their medical coverage not tied to their claim, and for their spouses and kids. It will cost them college benefits and their kids. Not that they even have that working the way it should. They lose real estate tax breaks from their states as well as reduced fees from their cities and towns. 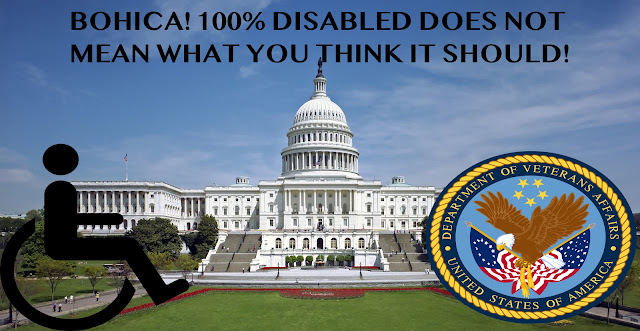 Discounts offered from businesses to disabled veterans will end because they are no longer 100% disabled. This is why veterans and families like mine are freaking out. Yet again, the Congressional Budget Office, the CBO, has put out another report that this benefit should be cut to save money. They were not even ashamed to admit it December 13, 2018. "End VA’s Individual Unemployability Payments to Disabled Veterans at the Full Retirement Age for Social Security"
And if you think I'm kidding on the Vietnam veterans part, here you go! "VA's regulations require that IU benefits be based on a veteran's inability to maintain substantially gainful employment because of the severity of a service-connected disability and not because of age, voluntary withdrawal from work, or other factors. About 48 percent of veterans receiving the IU supplement were 67 or older in September 2017, up from about 40 percent in September 2010. That rise is attributed largely to the aging of Vietnam War veterans." And then there is this part. This option consists of two alternatives, both beginning in January 2020. Under the first alternative, VA would stop making IU payments to veterans age 67 or older (the full retirement age for Social Security benefits for those born after 1959). That restriction would apply to both current and prospective recipients. Therefore, at age 67, VA disability payments would revert to the amount associated with the rated disability level. Under the second alternative, veterans who begin receiving the IU supplement after January 2020 would no longer receive those payments once they reach age 67. In addition, no new applicants who are age 67 or older would be eligible for IU benefits after that date. Unlike under the first alternative, veterans who are already receiving IU payments and are age 67 or older after the effective date of the option would continue to collect the IU supplement. Thank God they are no longer running Congress and did not push their through but what about the next time? Why should we have to worry about this one thing we were supposed to be able to trust from our government? How about making permanent actually mean that? How about never subjecting our disabled veterans to these nightmarish threats ever again? How about actually making sure the veterans who have 100% rating right now, no matter how the VA has decided to break it up--down--all around, and make it a flat 100% they never have to worry about again? As for when to reduce the ratings, start when you guys in Congress reduce the tax cuts you gave the wealthy first. You always manage to find the money for them...but not for our disabled veterans!